It’s very rare to have a week where both the Brighton Skate (Tuesdays)and London Skate (Wednesdays) start their street skating seasons one day apart. The Brighton Skate kicked off on Tuesday 1st May with a fun and relaxed sunset chill out at the West Pier skate pad with glorious sunshine, no wind and those long shadows (which remind me of summer evenings by the sea). 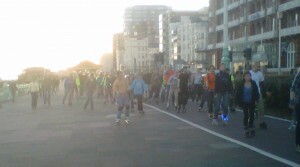 The head count came to about 60 people which well and truely puts the Brighton Skate in the ‘established’ category. The London Skate after two rained off Wednesdays was ready to go with a group of eager Skatefreshers intending to hone their skills before the Skatefresh Paris trip in 9 days time (11th May). Unfortunately the weather Gods were not smiling and some light rain falling at 7.30pm made the ‘no go’ call inevitable. Undeterred, our group plus a few extras we picked up on the way decided to do some skating and we did a sort of ‘lap of the park through to Kensington Gardens and ending up at the Vic. Differences between Brighton and London street skates? 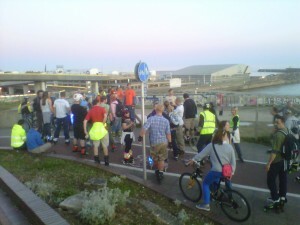 – Brighton skaters are properly lit up with flashing lights, glow sticks and even diamanted skates…..
– Fewer quads skaters in London attempting street skates. Perhaps this is due to the influence of Brighton’s Roller Derby team The Brighton Rockers? – London street routes are more or less circular, Brighton’s are more oriented along the seafront (due to mega hills away from the seafront). – London street skates have marshalls. Brighton feels like London Skate did over a decade ago before there were marshalls. – Brighton pedestrians constantly ask ‘what’s this all about then?’ While london pedestrians stand open mouthed and take photos. – Both skates have beautiful asboxes and bikes pumping out the music and dedicated volunteers who work hard to create a fun, free and safe setting for skaters to enjoy their sport. My personal thanks to everyone involved in running and organising London and Brighton’s street skates. They do a lot to promote the sport and bring new people into skating. Did you start skating after seeing one of the street skates go by? One Response to "London and Brighton Street Skate compared"
Get your love life rolling with Skatefresh!